Are Balsam Impatiens Perennial Flowers? Impatiens bloom profusely from late spring until the fall frost, providing bright color to window boxes and containers. When grown as a bedding plant, they create mounds of rich green foliage covered with abundant blooms, making them the top selling bedding plant in the United States, according to the University of Vermont. Routine care includes providing deep weekly watering, adequate nutrients and occasional pruning. Pinch or prune impatiens when they are 4 to 6 inches high by pinching off new growth on the ends of branches. Use your thumb and forefinger to squeeze out center leaves. This forces new growth to sprout along the branch and creates a compact plant with dense foliage capable of supporting abundant blooms. Repeat the procedure in three weeks, pinching out the center leaves on new growth to encourage further branching. Pinching delays blooming but increases the number of branches that later produce blooms. Overall, pinching increases the abundance of blooms. Trim or prune overgrown branches as impatiens mature. Cut back to the overall shape of the plant to improve appearance and promote healthy growth. If impatiens become leggy or cease blooming in midsummer, prune back to a height of 4 inches. A new flush of growth appears quickly and produces new blooms. Prune impatiens back to the soil level in late fall to move the plant inside for the winter. Place in indirect sun and keep soil moist. New growth appears within a few weeks creating an attractive houseplant that can be planted in the garden in spring. Look through your impatiens to identify flowers in need of deadheading. Blooms that are wilted, faded, withered or damaged can be removed. Pinch or pull off the flowers you have identified for deadheading. In the case of impatiens, you will not need any tools. A gentle tug or pull with your hand will be enough to remove the bloom from the plant. Discard the deadheaded blooms with your yard waste or in a compost pile or bin. Check your impatiens regularly throughout the growing season to see if additional blooms need to be deadheaded. Because they are self-cleaning, some of the plant's blooms should fall off throughout the season, but you can remove any unattractive or withering flowers as necessary to reshape the plant or keep it looking healthy. The most popular annual bedding plant in the United States, impatiens (Impatiens walleriana) receive high marks for nonstop blooms from June to frost. Rated on deer resistance, however, impatiens don't fare as well. Deer occasionally damage these plants severely. Repellents or fencing can help keep animals away from impatiens. Impatiens are symbolic of motherly love, according to Kathleen Karlsen from Living Arts Originals. Although impatiens come in a variety of colors, Ms. Karlsen writes that there are no specific meanings associated with each color. In medieval times, impatiens were used in gardens devoted to the Virgin Mary, the mother symbol of the christian world. Impatiens became popular in the United States in the 1950s, after "the father of impatiens" Claude Hope began mass-producing seeds for the American market, according to The New York Times Magazine. Impatiens can be used in flower beds, window boxes, as bedding or in hanging plants. Colors often include red, orange and white. Striped impatiens and double-headed impatiens are also easy to find. Impatiens are annuals that bloom throughout the summer growing season. Annual plants in general require more watering than perennials with a deeper root system. When planting impatiens, consider more shaded areas because the blooms will wilt or burn more easily in full sun. Impatiens need daily watering, but can tolerate less water if planted in the shade. Pinch off dead blooms often to encourage new blossoms to form. According to an article in The New York Times Magazine written by Michael Pollan, impatiens are now used too often in gardens across the United States. Although many gardeners love this easy to grow plant, to create a more unique garden, use impatiens sparingly. 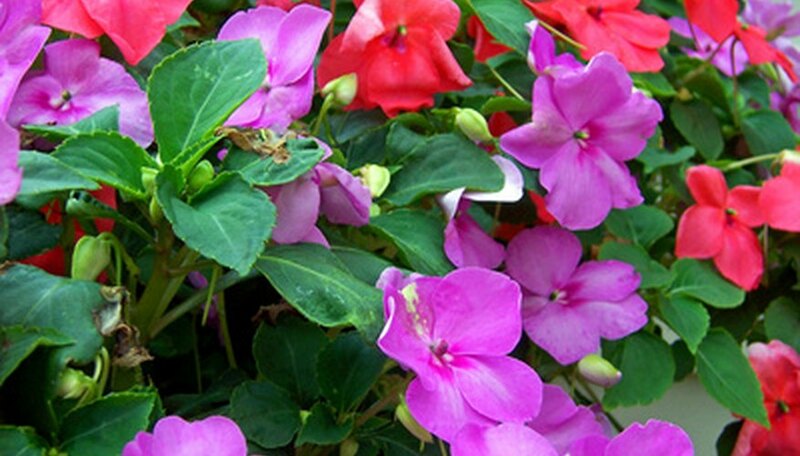 Impatiens are one of the majority of plants that are safe for cats and other animals. It is a nontoxic plant that can survive in shady spots as well as in containers. Choose a location with good drainage. Double impatiens love shade but will tolerate filtered light for a stretch of up to four hours in the morning, if it is not direct. Harsh, direct sunlight and heat are the enemy of these tender plants. Add a slow-release fertilizer to the soil and work until well incorporated. Fertilizer applied before planting will gradually feed plants over a longer period of time, promoting annual blooms throughout the season. Allow double impatiens starts to harden, or acclimate, to the outdoor location you choose before planting. Set starts in the shade and then into filtered sunlight for short visits over a period of several days. Plant double impatiens 8 to 10 inches apart to allow for mature growth. Taller species might require up to 18 inches between plants to reduce a leggy or spindly tendency because of crowding. Water well after planting. Double impatiens often require weekly watering in dry or hot weather. Pinch off double impatiens plants that are growing tall and spindly looking. This will create a bunchier plant with more blooms. Monitor the growth of your impatiens after you place the plants in the soil. They can start to look shaggy after a few weeks of rapid growth. Use a pruning shears to cut back the stems of the plants. Cut them to about 3 inches above the base of the plants. Watch for the impatiens to respond within one or two weeks. They will produce vigorous, bushy shoots. This happens because plants have buds all along the stems. When you cut back the stems severely, the remaining buds will shoot forth with growth. Remove any leaves or blossoms that do not fall by themselves to keep the impatiens looking neat and attractive. Impatiens are native to Eastern Africa and prolific throughout North America. The name is derived from Latin in reference to the way they shoot out seeds when the seed pods open. There are between 850-1,000 varieties of Impatiens that are grown all over North America. Most are annuals, producing flowers from early June until the first frost. In milder climates, there are also perennial varieties that flower all year long. Impatiens can grow from 6 inches to 2 feet tall. They are usually bought as transplants, but if seeds are used, start indoors 8-10 weeks prior to the last frost. Impatiens thrive in partial to full shade with moist, well-drained soil. They are ideal plants to use in shade gardens, pots, and borders. Cuttings from existing impatiens can be rooted in water or soil if placed in a warm, sunny spot to overwinter. In warmer climates, impatiens can grow tall and spindly so take care to choose varieties that are more compact. Impatiens played a starring role in Epcot’s 16th Annual Flower and Garden Festival. Their multicolored hues were showcased in 100 floating mini gardens in Epcot’s ponds. Dig a hole under the pine tree using a garden shovel or trowel. Make the hole as deep as the root ball of the impatiens plant. Spread 3 inches of a slow-release fertilizer evenly across the bottom of the hole. Remove the impatiens from the container and place it in the hole. Fill the spaces around the impatiens' roots with garden soil. Add 2 inches of water, or water until the soil is moist throughout. Space the next impatiens 18 inches away for tall-growing impatiens and 8 inches away for compact impatiens. Fertilize impatiens every month with a water-soluble fertilizer, as the impatiens' roots compete with the pine trees' roots for nutrients. Continue to add 2 inches of water to the impatiens each week. Check the soil after rainfall to ensure enough water reached the impatiens through the pine tree branches. Fertilize the New Guinea impatien for the first time three weeks after planting, and use the fertilizer solution in place of water every third watering. Water the New Guinea impatien bed until moist if the soil is dry. Allow the water to drain completely. The soil should be moist, but not saturated when you fertilize, so you may need to allow three to four hours for the soil to drain. Fill the garden sprayer with a mixture of water and 10-20-10 fertilizer with minor elements at the lowest rate recommended on the fertilizer package. Spray the soil around the New Guinea impatiens until saturated, as well as the plant’s foliage. Balsam impatiens (Impatiens balsamina), commonly called balsam or touch-me-not, is an annual plant, not a perennial. It grows in full sun to shade, with plants in USDA zones 8 and above needing more shade.